If you’re pregnant or you have a child who loves wearing nail polish, the last thing you want to do is paint on a coat of toxic nail polish! Most commercial nail polishes contain a slew of shady ingredients like formaldehyde, acrylates polymer (essentially plastic), artificial pigments, toluene and dibutyl phthalate (DBP). Plus, many top-selling nail polish brands have recently been exposed because they contain an endocrine disruptor that seeps into women’s bodies. Yikes! Luckily there are some safer nail polish brands out there, including the very safe Kid Licks. Kid Licks claims to be, “the world’s first and only organic, edible nail polish.” Kid Licks, is entirely safe and non-toxic — and was created by husband and wife team Audrey Amara and Josh Kroot when their young daughter wanted to start painting her nails by herself. Made with fresh organic fruits, vegetables and plants, this nail polish is so safe you can actually lick and eat it. Keep reading to see the perks of Kid Licks over other nail polishes on the market. Kid Licks is easy for young children to apply, and has a smooth, shiny and natural looking color. The polish lasts for the better part of the day once fully cured, unless your tot goes swimming or takes a shower. To remove this polish you simply scrub (scrub hard) with plain ol’ H20. Kid Licks does not contain any gluten, dairy or nuts (either peanuts or tree nuts), however, note that it is made in a facility that processes items containing gluten, dairy and nuts. The company is working on changing this, but for now, if your child is very allergic to gluten, dairy or nuts, avoid this polish. Because Kid Licks is free from all chemical preservatives, it should be refrigerated after you open it, and if kept cool, will last for about two months. One issue to be aware of is that Kid Licks colors come from natural fruits and vegetables, so some may stain more easily than others. The company recommends keeping Kid Licks away from carpets and nice clothes but notes that, “a quick rinse with water will often keep a stain from becoming permanent.” All-in-all, if your little one is begging to wear polish, Kid Licks may be your safest (while still fun) option! Kid Licks is currently available in three earthy colors: beet red, sour carrot orange and barley grass green. If you're pregnant or you have a child who loves wearing nail polish, the last thing you want to do is paint on a coat of toxic nail polish! Most commercial nail polishes contain a slew of shady ingredients like formaldehyde, acrylates polymer (essentially plastic), artificial pigments, toluene and dibutyl phthalate (DBP). Plus, many top-selling nail polish brands have recently been exposed because they contain an endocrine disruptor that seeps into women�s bodies. Yikes! Luckily there are some safer nail polish brands out there, including the very safe Kid Licks. 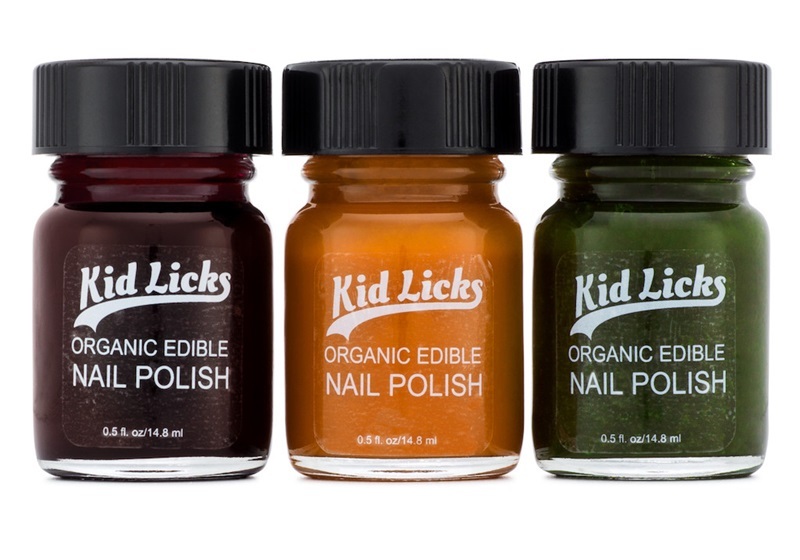 Kid Licks claims to be, "the world�s first and only organic, edible nail polish." Kid Licks, is entirely safe and non-toxic -- and was created by husband and wife team Audrey Amara and Josh Kroot when their�young�daughter wanted to start painting her nails by herself. Made with fresh�organic fruits, vegetables and plants, this nail polish is so safe you can actually lick and eat it. Keep reading to see the perks of Kid Licks over other nail polishes on the market.